Finally arrived back to say hi. 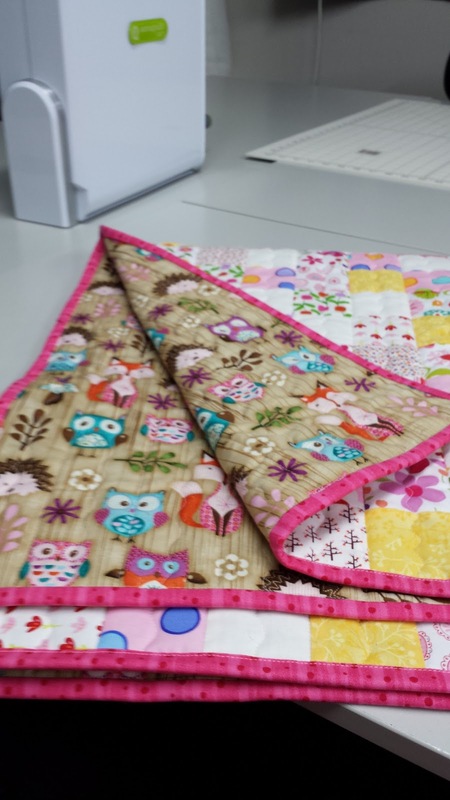 Have not been doing a lot of stuff, but did manage to make two baby quilts to give away. Loved doing something small and pretty. Used up scraps with both of them, although confess to having bought a couple of pink fat quarters for one, plus a pink binding fabric. My stash does not contain a lot in the way of pink. Anyway, forgot to take photos of the first one, so here are the photos of the second one. Love the little pops of yellow. The backing fabric I found in my stash too, so that was an extra bonus. Gives two sides to this quilt. Loved the wavy stitch on my new Janome 9400. It looks great the way it stands out on the white squares and adds a little texture. Now it's back to grandson's quilt as you go blocks. I am now up to 17 done, 23 to go. 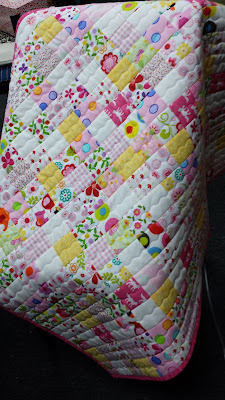 Jessica's is finished but not quilted...will give you pics when finished completely. Short post as just get too tired these days. Have a great week and will catch you again some time. Thanks for coming back to see me. Linking to Cynthia Brunz @ Oh Scrap. Link is on the side of this post. Take a look, you will love her quilts. That is one cute scrappy quilt Clare. I love the pink and yellow together. Thanks for sharing with Oh Scrap! I just love scrappy quilts, they have so much to look at. The backing fabric is lovely as well. You are certainly enjoying your new machine. Such a pretty finish! and I love the backing fabric! Such a pretty bright quilt. 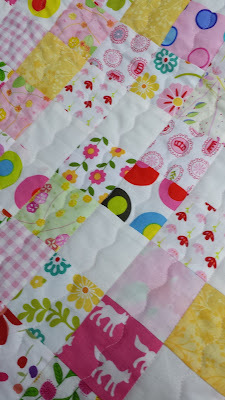 Love the quilting - not overdone.